With Christian Eriksen's contract at Tottenham expiring in the summer of 2020 - and with no indication that the Dane is ready to sign a new and improved deal at the club - the north London club will be keen to offload their star playmaker this summer, for fear of losing such a valuable asset on a free just six months later. Real Madrid have been the club most heavily linked with Eriksen, where a squad overhaul is imminent following a disappointing campaign. PSG and Juventus are also rumoured to be keen on the midfielder - Juventus in particular are renowned for picking up talented players for little to no fee. In an ideal world - for ​Spurs fans, of course - ​Eriksen would sign a new contract and remain the heartbeat of the team for years to come. Practically, however, the transfer committee will be planning for the worst case scenario. Hakim Ziyech, Ajax's dynamic attacking midfielder, has been heavily rumoured, but, stylistically, an Englishman at ​Leicester might be more suited to taking over from Tottenham's number 23. James Maddison, who very well may want to stay put at Leicester, will certainly be on the radar of England's top six teams. In regards to his style of play, he resembles Eriksen fairly closely. Of course, he is not at the world-class level of the Dane, but, at 22, he has room to grow and develop his game further. Both Maddison and Eriksen excel at passing, whether it be keeping the ball ticking in the midfield, finding the killer pass in the final third, or delivering expert set pieces. Maddison leads the Premier League for key passes per game this season, with 3. While Eriksen's 2.1 is slightly behind his usual standards, since his arrival from Ajax in 2013 he usually delivers above or around that level, he remains consistent at providing assists. James Maddison has now scored three goals directly from free kicks in the Premier League this season; more than any other player in the competition this term. Neither Maddison, nor Eriksen, are the most talented dribblers in terms of taking the ball past their opponent, but they do have expert close control, and the intelligence to take up positions on the pitch that give them time on the ball to produce a moment of magic. They are each also capable of playing as a classic number 10, or slightly deeper as an 8, which Maddison has been doing to great effect since Youri Tielemans' arrival at Leicester in January. Likewise, Eriksen has had to do the same at Spurs this season, given the distinct lack of creative options in the centre of midfield. Maddison has also earned a reputation as a free-kick specialist, scoring more from this scenario than any other Premier League player this season. While Eriksen is on a particularly long dry spell on that front - not scoring one for Spurs since Juventus away last season, and not in the Premier League since as far back as 2015 - he has also gathered that standing due to the volume of free-kicks he scored in his earlier playing days. Both have a similar striking technique, enabling the ball to dip quickly from a curling effort. 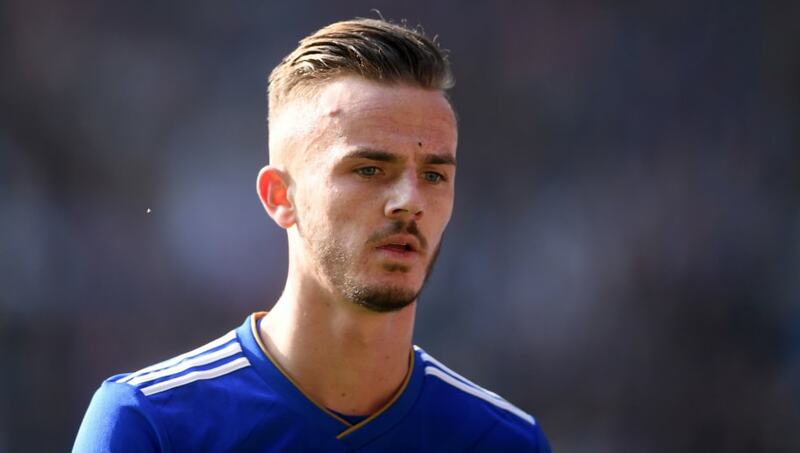 Maddison's performances this season have been so impressive, in fact, that - given England's lack of technical quality in midfield - he must be a shoo-in for the Three Lions squad that takes part in the Nations League this summer. Although he is eligible to play for the Under-21 side that will participate in the Euros - also in June - the former Norwich man is capable enough to play for the seniors, where his creativity in the final third is unmatched. While the holding role in Southgate's 4-3-3 will likely be contested between ​Eric Dier, ​Jordan Henderson and perhaps Declan Rice, Maddison's rivals for the other midfield spots are plausibly ​Dele Alli, ​Ross Barkley and Harry Winks. While Dele has a higher goal threat, and Barkley is more of a powerful runner with the ball, Maddison's guile and flair should at least propel him to a squad place. This summer could be a big one for the 22-year-old. With the Nations League on the horizon, a fine end to this campaign for Leicester could see Maddison not only earn a call from England, but also a Champions League level club, which could potentially propel his already bright future even higher.